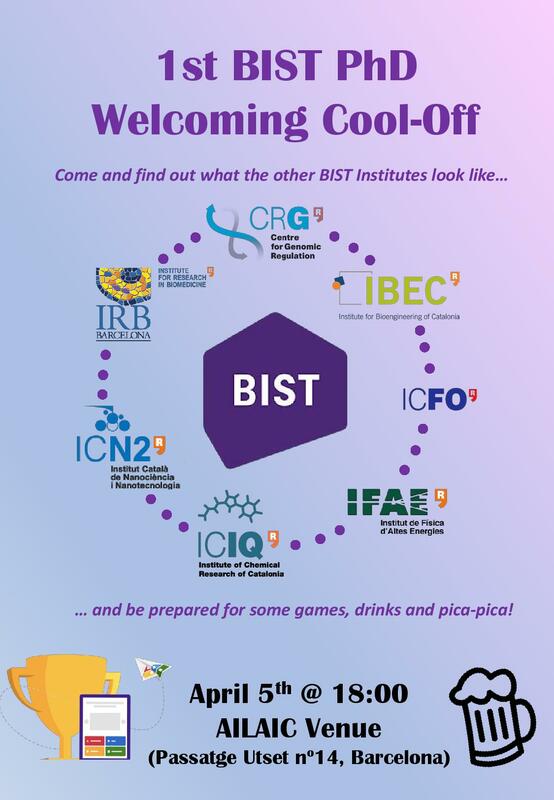 This week, student representatives from some of the BIST centres, including IRB Barcelona, IBEC, CRG, ICN2, and ICFO, together with BIST are organizing the first joint BIST PhD welcoming cool-off at 18:00 on April 5th, 2019 at AILAC near the Sagrada Familia in Barcelona. 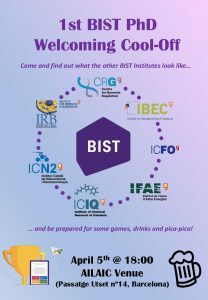 If you are a PhD student and are eager to get to know your peers from the different BIST institutes, then come and enjoy the first joint cool-off! The special focus is to welcome starting PhD students but more senior PhDs are more than welcome as well. The event itself will kick off with a brief overview of each BIST institute given by the respective PhD representatives. Following this, there will be a quiz about science and general knowledge but no worries, as attendees will tackle the questions in a multidisciplinary team. The event will finish with an informal get-together and networking over drinks and some pica-pica. For all interested PhD students, please confirm your attendance as soon as possible by signing up here: https://goo.gl/forms/93TClMPxtJyNhaIl2.